Our Church is involved in a number of ministries in the town of Greenwood, S.C.
Our church sponsors the Good News Club at Rice Elementary School. Good News Club meets on Monday afternoons at 2:00 PM. Good News Club is a ministry committed to spreading the good news of the gospel to children all over America. To learn more about Good News Club, check out their website! To learn more about how you can support this ministry, contact our church office! 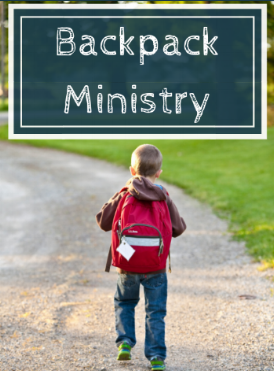 The Backpack Ministry provides children in Greenwood with food to eat over the weekend who may otherwise do without. Bags are packed at our church, delivered to a local school, and sent home with children on Friday. Please contact our church office if you are interested in shopping, packing, delivering, or contributing financially!